Following pressure from US President Barack Obama, NATO and former defense chiefs, Prime Minister David Cameron now faces calls from America’s top general to meet the military alliance’s 2-percent-of-GDP military spending target. 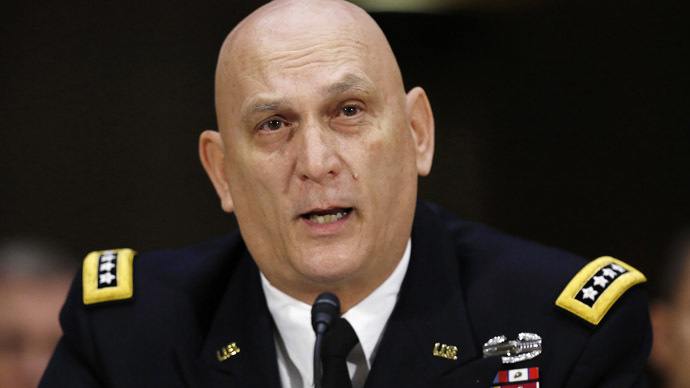 General Raymond Odierno, Chief of Staff of the US Army, told the Telegraph he was “very concerned” at the cuts being made to the UK’s armed forces. He criticized Chancellor George Osborne’s refusal to confirm whether the UK will meet NATO member states’ spending target of 2 percent of respective national GDP. Odierno’s comments follow remarks from the US President, who told Cameron in January that further defense cuts posed a risk to global security. Critics of extending austerity to the defense budget fear cuts in spending would harm one of the central pillars of the NATO alliance – Britain’s provision of military hardware to US-led campaigns. Since the 2010 Strategic Defence and Security Review, the British Army has been cut by a fifth, with troop numbers reduced from 102,000 in 2010 to around 82,000 by 2020. The government plans to increase the number of reservists. The Royal Navy and the Royal Air Force (RAF) are both preparing to lose 5,000 regulars and gain 500 reservists over the same period. Odierno further warned NATO must be “prepared for Ukraine,” whose destabilization posed a threat to global security. He also said America and its allies should be ready to join Iraqi forces in the battle against Islamic State (IS, formerly ISIS/ISIL). Iraqi troops will begin an offensive to liberate Mosul, Iraq’s second-largest city, later this year. It fell to IS forces in 2014. Decisions to cut military spending could also prove costly to David Cameron, who is attempting to win another term as prime minister in May, but Cameron dismissed Odierno's comments, saying Britain remained a "strong and capable partner" for the US. Speaking at a campaign event in Colchester, the Prime Minister said the UK's defence budget was the fifth largest in the world and second only to the US in the NATO alliance. "You can see that very specifically today in Iraq, where the second largest contributor in terms of air strikes and air patrols is Britain by a very large margin. You have to add up several other countries to get to the scale of what we are doing, second after the Americans." The Prime Minister praised the capabilities of the Royal Air Force (RAF), suggesting that he sees air-power as the key to any future foreign intervention. "Look at the RAF, a lot of it based in my constituency in RAF Brize Norton. We have got the A400Ms coming on stream, the Voyagers are now refuelling aircraft, brand new aircraft, above the skies in Iraq. You have got the Joint Strike Fighter next to come." "So it's an incredible programme of equipment that will make sure we have some of the most capable armed forces anywhere in the world," he said. Former Defence Secretary Liam Fox said Tory MPs would find it “hard to swallow” cuts that allowed spending to fall below the 2 percent threshold, while a pledge to spend 0.7 percent of GDP on foreign aid was maintained by the government. His sentiment is echoed by former NATO chiefs, including Anders Fogh Rasmussen and Jaap de Hoop Scheffer, who have previously said cuts to defense spending would send a message of weakness to global aggressors.